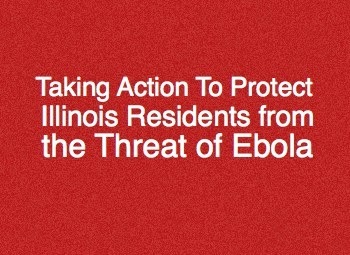 The Illinois Department of Public Health (IDPH), the United States Centers for Disease Control (CDC), and the Illinois Emergency Management Agency (IEMA) worked together to review and confirm protocols and plans already in place to ensure the Illinois public health system is able to quickly identify a potential case of Ebola. At this time, there have been no reports or questions in Illinois that have led to Ebola testing for suspected cases. IDPH will continue to monitor for cases. According to IDPH, at this time, Ebola does not pose a great health risk to the people of Illinois. The CDC has prepared the a fact sheet about Ebola here are a few of the highlights. Ebola is not an airborne infection. Ebola is spread through direct contact with blood or body fluids of a person who is sick with Ebola. A person who is not experiencing symptoms, such as fever, vomiting, diarrhea, cannot transmit the virus. The incubation period, the period between becoming infected and showing symptoms, is two to 21 days. Provided guidance to hospitals and public health partners on laboratory specimen submission and case management. Confirmed plans to establish an Ebola hotline. Completed a CDC online assessment of IDPH’s emergency preparedness and response activities related to Ebola. IDPH has activated a hotline to help provide answers to questions the public may have, including who may be infected with Ebola, how is it spread and what can be done to avoid it. The hotline phone number is 800-889-3931. IDPH is using established partnerships with local health departments and other health care providers and using current infection control measures to protect against Ebola. IDPH is working with local health departments and other health care partners to provide guidance on how to quickly identify a potential case, evaluate the person and isolate them if needed, implement infection control practices, conduct contact tracing of people potentially exposed to a suspected case, submit specimens for laboratory testing and provide care for the patient. Illinois hospitals following CDC infection control recommendations that can isolate a patient in a private room are capable of safely managing a patient with Ebola. Illinois specimens that may need to be tested for Ebola will be submitted to IDPH. IDPH will coordinate testing of the specimens with CDC. It takes 48-72 hours for test results to come in. Voluntary compliance to isolation or quarantine request is preferred, but if an exposed person does not voluntarily comply, public health authorities can issue an “order” for isolation or quarantine. State statutes allow IDPH to issue isolation and quarantine orders. IDPH has delegated primary responsibility for issuing and enforcing orders to certified local health departments. A governor’s proclamation is not needed to issue or enforce isolation or quarantine orders. As of now, IDPH does not see the need for additional funding for preparedness operations. The Illinois Hospital Association is closely monitoring ongoing developments concerning Ebola Virus Disease and is in regular contact with key staff and officials at IDPH. CDC is setting up a dedicated CDC Response Team that could be on the ground within a few hours at any hospital that receives a confirmed patient with Ebola. The CDC Response Team would provide in-person, expert support and training on infection control, healthcare safety, medical treatment, contact tracing, waste and decontamination, public education and other issues. The CDC Response Team would help ensure that clinicians, and state and local public health practitioners, consistently follow strict standards of protocol to ensure safety of the patient and healthcare workers. Conference calls with professional organizations to discuss member questions or concerns and to increase dissemination of critical information to healthcare providers. Screening operations at O’Hare have begun and are being handled by the federal government. IDPH will be available to provide any assistance that may be needed. CDC and the Department of Homeland Security's Customs & Border Protection (CBP) have established entry screening at five U.S. airports that receive over 94 percent of travelers from the Ebola-affected nations of Guinea, Liberia, and Sierra Leone. Travelers who require additional evaluation or monitoring will be transferred to Resurrection Medical Center. Rush University Medical Center in Chicago will be the backup location. The screenings will be handled by the CDC. CDC will notify IDPH of any passengers who are determined to be exposed to Ebola.